All cooked out, all blogged out: That’s how I’ve been feeling lately, which explains my unprecedented 6 day absence from blogging–even longer since posting one of my own recipes. Though I’ve been spending lots of time reading cookbooks and finding recipes that give me plenty of inspiration, when it comes time to actually go into the kitchen and cook something, I seize up and become completely incapable of deciding what to cook. Then I wind up throwing together my dirty secret soup or an old favorite like arrabbiata or just give up and call the nearest sushi place for takeout. I call it food blogging burnout but it’s probably some kind of low-level depression caused by too many rainy days and too little sunlight. Now, I’m telling you all this for a very simple reason: I’m hoping you’ll take it easy on me when you see the following recipe, one that’s guaranteed to offend everyone from lunchbox gourmands to raw foodists. If you loathe food out of cans, object to microwave ovens, or fear cooking in plastic, get away, quick, and don’t look back! Because what you’re about to see might shake you to your very core. Just about everything in it came out of a can or a jar, and I heated it in plastic in the microwave. All together, it took me just 6 minutes, about the same time it would have taken to make the peanut butter sandwich she begged me not to make. And you know what–she loved it. 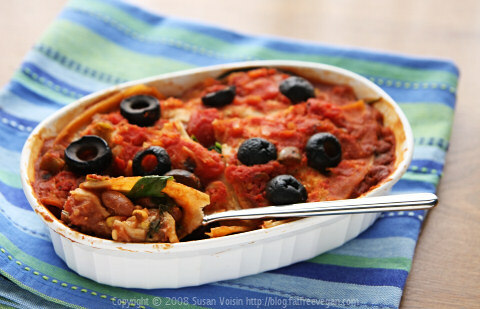 While I was at it, I put together two more servings of this ridiculously easy enchilada casserole, one for my husband to take with him to work and one for myself. I figured I needed something stronger than salad to pull me out of my blahs, and a hot lunch just might do the trick. You know, it may have worked: it was a tasty and warm treat on yet another cold, rainy day. And, more importantly, it gave me something to blog about! The amount of ingredients you need for this will depend on the size of the container you’re making it in. My daughter’s 12-ounce microwaveable thermos held less than the CorningWare dishes that I used for my and my husband’s lunches, so the ingredients listed below are just approximations based on one serving–you may find you need more or less. 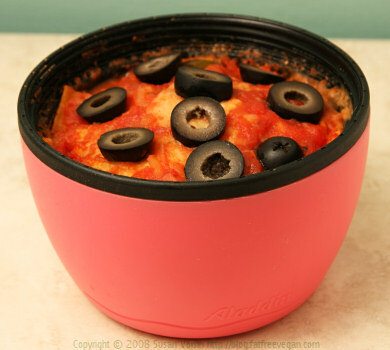 Cover the top loosely with waxed paper (do not use the thermos top), and put the dish into the microwave. Cook on high power until heated all the way through, 2 to 3 minutes. Microwaves vary, so check to make sure that the inside is warm by inserting a knife into the middle and checking a sample. If you’re making this in a thermos, it will continue to cook after you’ve sealed the container, so getting it hot in the middle is not so important. If serving right away, heat it until it’s very hot and then let it sit for a few minutes to cool. My daughter will devour this! BTW- where did you get the microwaveable thermos/container in the photo? Could I also heat this in the oven if I’m preparing it in a glass casserole dish? Oh my, this is good. I whipped this up for lunch and put it in the oven for 30 minutes @350. I am fighting my meat eater kids for this. Yes! This is my kind of recipe. Easy, microwave-able, delicious. I live alone and after a loooong work day I’m hard-pressed to have any desire to cook a meal for one. Recipes like this will keep me away from taco bell. More please! And thank you! I’m noticing that is an UNGODLY amount of salt for one serving. Is it a typo, or do you have any suggestions to reduce that? The sodium’s mostly from the canned beans and salsa, so if you make your own or buy low-sodium versions, you can reduce it greatly. Someone gave me a link to this years ago before went fat-free, but i think some other website had stolen this! Now, that looks good!!! Definitely will be trying this! The recipe itself sounds wonderful though, thank you. If I wanted to do this on a larger scale, say for my 5 year old’s pre-k class of 12 kids, and do it in the oven so as to accomodate the size baking dish I’d need, can you tell me a good temperature and lenght of time to bake it? Thanks! Is this like flat tortillas you’d use for wraps or like tortilla chips? This recipe uses the small, soft, flat corn tortillas. No comment, other than the recipe I read sounded both edible and simple. I am vegetarian for many years, now wanting to become become. I would like to be on your ‘list’ and receive regular downloads, if you send them. What makes the sodium so high? Any time you use canned beans and salsa, the sodium will be high. This does seem excessive, so I may recalculate it.